Mme. Devine, whose portrait appears on the front page of this issue, needs no introduction to the readers of The Musical Courier. She occupies an assured position in the front rank of New York vocal teachers. She is a San Franciscan, and made her home in this city some six years ago. A singularly large proportion of Californians who come to the metropolis attain prominence in their respective professions. Either the climate or sturdy ancestry seems to have bestowed upon them a more than ordinary amount of energy and ambition. The secret of Mme. Devine‘s success is to be found in the possession of a very large share of this native energy, or capacity for hard work, combined with rare musical gifts and a thorough knowledge of the vocal art, derived from many years of study with Francesco Lamperti, one of the greatest of teachers. We may look upon him as the connecting link between the glorious old Italian school in the eighteenth century and what good there still remains in vocal art to-day. He received the traditions of that school from its last great disciples. such as Crescentini, Pasta, Velluté, and he has handed them down to us enriched by fifty years of experience and a record of achievements in teaching that stands absolutely unrivaled. No higher compliment could be given to the subject of this sketch than to say that she has shown herself worthy of this master in every respect, first as a singer, and now as a teacher. When Mme. 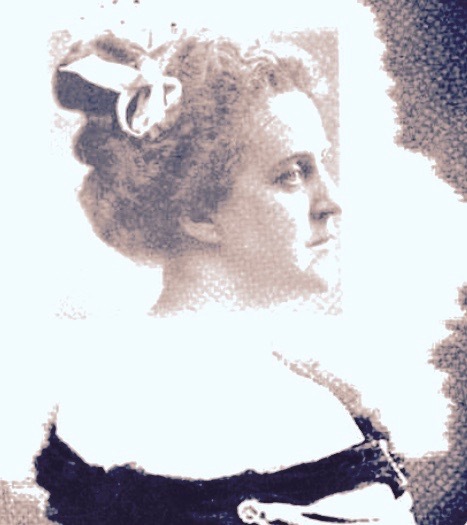 Devine made her debut in BadenBaden, the late Herr Dr. Richard Pohl said in his criticism of the event: "Her voice is so well schooled that one immediately inquires with whom she has studied." On nearly every occasion the same praise is now bestowed on Mme. Devine’s pupil, Miss Duffield. At last then we have somebody who can give us Lamperti's results, and that is what we want. We are tired of Lamperti discussions, of "exponents," "representatives" and "certificates." We do not care how well a teacher can talk, lecture, write articles or books: We only ask for results: everything else is of no account. Speaking of Miss Duffield to a representative of The Musical Courier, Mme. Devine said: “There is a case that illustrates what method and perseverance will do for a voice. Four years ago who would have thought that the little 'parlor voice' could ever sing before an audience of 10,000 people in an immense place like Convention Hall, Kansas City, and make the great hit that Miss Duffield did when she sang there with Sousa, a few weeks ago. Yes, it is wonderful what method can do for a voice. Given a pupil who has musical intelligence, artistic sensibility and undaunted perseverance, for such a one it is almost possible to create a voice. Did not Pistocchi make one of the most distinguished singers out of Bernacchi, whom nature had given an inferior vocal organ? Unfortunately the three qualifications mentioned are not often found in one individual. It is not so easy to find girls with the necessary mental and artistic endowments who will study consecutively for three or four years. “Then you think that it is largely a matter of sticking to it long enough?" "Yes, provided you are on the right track. No amount of time spent on a bad method can make a good singer." “When the student has advanced to the point where it is advisable to use words, I do not begin to give simple ballads; I then take up the old Italian arias, because they contain all the technical difficulties to be found in any piece of music, while the pure vowel sounds of the language are conducive to the development of pure tone. These arias are studied as exercises, and it does not matter at this stage of her training if the student is not sufficiently conversant with Italian to understand the text. Public taste may condemn these florid arias in the concert hall; in the vocal studio they will always remain the crucial test of good voice production. Whoever masters them will have the power, range and flexibility necessary to sing anything, even Wagner." "Then you believe that the old Italian method is perfectly adequate to modern dramatic music?" "There is only one way to sing: the way Sembrich was taught. The idea that modern music demands a different kind of training for the voice seems to me absurd. The old masters taught their pupils to find the beautiful tone, and worked with them for years till they could do anything with it. What more can modern music demand? lf tonal beauty is to be made a secondary consideration, singing ill-generates into a hybrid, inconsistent art, and the sooner we come down to plain speech the better. Are screeches and howls, if delivered with sufficient dramatic intensity, to compensate for lack of tone quality and true musical expression? Because the old Italian method gave singers such astonishing control over their voices that they were able to execute the most elaborate vocal pyrotechnics, it does not follow that their method of voice production did not also make them capable of emotional and dramatic expression. The greater includes the less, the more difficult the less difficult. Remember the story of how Farinelli, when rebuked by Charles VI for wasting his marvelous powers on ‘never ending notes and intricate passages' changed his style entirely, and became the most pathetic singer as formerly he had been the most brilliant coloraturist. And why not? Does it not seem reasonable that a voice under such control that it is like a precise instrument on which the most elaborate runs and cadenzas can be played with perfect case, is just the kind of voice that will be able to give most adequate expression to the deepest emotions of the human heart, because a singer thus equipped can give up his attention and imagination without restraint to the thoughts and feelings he is interpreting, and his voice will readily and without effort respond to every impulse of his inspiration. The present confusion in vocal art as shown in the numerous conflicting opinions about registers and voice placing, is largely an outcome of the futile attempt to find a new method of singing for modern dramatic music. I thoroughly agree with the able critic of the New York Time: that there is nothing in the music of Wagner that demands the application of new laws to singing either in recitative or cantilena, and that ‘the so-called Wagnerian school is an illusion, a delusion and a snare.’"
Mme. Devine evidently adds to her other qualifications an unbounded enthusiasm which makes her an eager student of everything connected with her art and makes the seemingly arduous work of voice training a pleasure to her. Earnest and talented pupils are sure to find in her not only a painstaking teacher. but a sympathetic adviser in whom they can place implicit confidence. —The Musical Courier, April 11, 1900, page 17. See? There is it again! That whole thing about singing on exercises and scales for a long while before singing with words. The very same thing that I keep hammering and yammering about on these pages. No one wants to do it until they find out the good it does. Finding that "good" takes time, often more time than the student wants to allow. Students arrive at my door, many of them with advances degrees and vocal flaws firmly intact. They know something is wrong, but don't know how to fix it, but have not been taught to work on technique in a focused and systematic manner, having spent their time singing songs and arias, hacking away for 30-45 minutes with no improvement in sight. They wonder why things aren't getting any better, and talk about not "moving the air" enough, or having the right "support." You'd think from all this that singing was simply a matter of moving one's muscles. And yes, while the muscles of the body do move in particular ways, that's the least of it. You have to know what to think and pay attention to that before you become aware of your muscles. The teachers of the old school made the student do simple things, like shut the mouth and breath though the nose. This "route" was then then kept regardless of whether the mouth was closed or open. Then the teacher attended to the student's vowels. Breath and vowels. Not muscles. Not moving air. Not any of the mechanically-minded stuff students "do" today—their doing being manipulative rather than creative. If there is one simple truth that reflects the teaching of the old Italian school of singing it is this: Meaning moves muscles. That's the correct order of things. The Italian on the street corner calling cross the square does not think to move his muscles to communicate his joy in seeing his old friend. No. This face opens wide as does his throat; and his greeting sails across the distance, ringing and clear. Of course, he hears what he's doing as he's doing it—whether he's consciously aware of it or not. The singer? He has to become conscious without being self-conscious. That is what makes it art.